What role does Satan play, if God is in control of all things? Thanks for the question, Ross. When the Spirit spoke to me on August 23, 1981, and set me free from faith in the devil so that I could place all my faith and all my fear in my heavenly Father, Satan became irrelevant to me. However my Father chooses to use him is my Father’s business, and I do not have to even think about it. The overall point is that, whatever role that the Father decides Satan will play in any situation, Satan has no control and no authority over the circumstances of our lives. As I wrote in my book, “All Things” (Current title is Suffering and the Saints, see above link), Satan cannot even stick out his tongue at us unless God tells him to stick it out. And even then, he must keep it stuck out until God tells him to take it back in. The same is true of ungodly people. They cannot determine anything that happens to us, and that knowledge saves us from bitterness. It is so comforting to know that no matter what happens, God is still God, and Jesus is still Lord of ALL. Your teaching today was such an eye-opener, regarding the truths contained in the writings of Hebrews. The relationship between Father and the Son is so OBVIOUS!! And the facts about salvation are OBVIOUS!! It’s perplexing to see how the insidiousness of Christianity has stolen true hope from the hearts of seekers, so that they barely stand a chance, once they’re ensnared in the web. The confusion surrounding “saved” vs “conversion” is truly Satan’s greatest masterpiece; an accomplishment that grieves my heart day in and day out. The Slanderer replaced hope with “you’re saved now.” And millions have bought into it; hook, line and sinker. There is a blind arrogance, that, once conceived and established in a believer, robs the truth from that person’s heart, and robs the fear of God, certainly, as well, from their heart, so that they cannot grow in the knowledge of the truth. It’s as if they are stillborn. They stop growing spiritually, yet on the outside it may seem as if they are reformed and born-again. Christianity enables many to act as if they are living right, while never having actually experienced forgiveness from God, via the new birth. It is a religion built on “faith alone,” compounded by forms and rituals and phrases that make it all seem so good and pure. . . and pious. Ohh, what a whitewashed facade!! The “pearl” of the day comments on this: A person can be reformed, without being cleansed from sin. Their behavior makes them seem to be changed, but on the inside. . . well, you know. I’m always perplexed by Christians whose lives seem to be truly changed by the power of God, and they give Jesus the credit (they claim unashamedly to be disciples of the Lord), yet they embrace an organization that teaches against THE POWER of God. I am constantly humbled and elated by the truth. And I am grateful. Thank-you for getting together this morning and teaching this. How ANGRY I feel, that so many of our brothers and sisters are believing that lie. After all, God “saved” me from that Thing, and it is discouraging that Satan has robbed us from having fellowship with those dear ones who are still IN THAT THING!!!!!!! That steams me!!!!!! Is that a sin to feel this way? I hope not. I do not know what God has in store for us around the corner but I sure do want to be in my place when it comes. Thank you for being who you are, hearing from God and passing it on. Good morning pastor John! PRAISE THE LORD! PRAISE HIS HOLY NAME! How are you doing? I hope you’re doing very well! I saw your videos on your channel via YouTube and let me just say that you’re a true man of God!!! Thanks to your awesome resources on your website, me and my family hold prayer meetings at our house 2 days per week (Friday & Saturday afternoons) and the meetings helps us grow stronger and stronger in God! Our youth participates in our prayer meetings too and they seek and hunger for God so much! Thank you so much for the info on your site and I look forward to following up with you via Twitter and Facebook (I always follow your tweets lol). You have a wonderful and blessed day and take excellent care. I just wanted to thank you for the CD i received “Fill Us with Glory Now.” As i sit here listening to it now i cant help but be so thankful for all of the blessing that God gives me and my family each and every day. This song is one of those blessings. Thank you and may God be a blessing to you and all that you do! comments: 1.How many leaders call by God agree with your teaching? Very few that I know of. There is a question, however, that reveals an even more significant problem in the body of Christ: How many “leaders called of God” agree on any doctrine? The body of Christ on earth is in a divided mess. The truth that I am teaching can heal the body, and I hope that it will one day heal the division that seems to exists between us. 2. How can you teach and believe in tithes and not accept water baptism? No. It is a public confession of ignorance. The only acceptable “public confession” of Christ is Christ- like conduct. 3. You say you are not a Christian, Then you are not Christ like right? I hope Jesus sees me as living a Christ-like life, and you, too. Part of my effort to be Christ-like is to obey his voice and come out of Christianity – and not be a Christian because Christ himself is not one. Yes, it does. But it does not tell us who called them that. Whoever it was, it was not the apostles. They would have never made such a claim. Somebody else did it to them: “they were called”, not “they called themselves”. I don’t know which Bible you have been reading, but the Bible I read tells me he condemned a bunch of people, calling them “sons of the devil”, liars” etc. Please stop resisting the truth. I have seen people lose their minds trying to oppose it. You know better than to say such a thing. Please do not push Jesus too far. I can assure you that such is not the case. do you believe you are the only one right and everybody else has it wrong? Not at all. I believe God is right, and everybody else, except Jesus, has it wrong. I trust only his doctrine, his baptism, and his spirit. I hope that we can at least agree that neither you nor I am right. Only The Father and the Son. Then, we can begin to walk together in their light instead of a doctrine, a baptism, and a spirit that came to us from someone else. The last time I asked question you never posted to the site to give others a chance to see are you afraid to let them see the questions asked? I am sorry. I don’t remember that. If possible, you can re-send those questions to me, and I will answer them as best I can. Bless you, Bro John….and sometimes we get it coming and going. Hi Sister Rita. Good to hear from you. Jesus’ baptism is not the one he received at the Jordan. That was John’s. Maybe if we used another example, what I teach will be made clearer: Jesus’ circumcision is not the one his human body received when he was eight days old. Jesus’ circumcision, baptism, communion — everything in his kingdom — is in the Spirit, not in the flesh. Yes, the Father must have been very happy with His Son at the Jordan. But then, can you think of a time when the Father was not happy with him? The Son always did what pleased the Father. comments: nos alegra tanto el poder ver los cultos que ustedes realizan,en chile tambien estamos buscando màs y màs de la hermosa presencia de nuestro SEÑOR,sabemos que su Espiritu Santo lo esta llenando todo,preparandonos para ese dia glorioso de su venida.Nosotros vivimos en una ciudad llamada Quilpuè en la provincia de Valparaìso donde ocurriò a comienzos del 1900 un gran avivamiento. Esperamos uno mayor para toda esta naciòn que tanto lo necesita. Reciban las màs ricas bendiciones, que EL SEÑOR les sea dando y dando màs abundamente de lo que pidan o deseen ya que como dice en Santiago 4:5 “EL ESPIRITU NOS ANHELA CELOSAMENTE” les amamos aun sin conocerles ,orando los unos por los otros. She says that they rejoice greatly in watching your services, she says that in Chile they are also seeking for the glorious presence of our lord, and says that she knows that His presence is filling up all, getting is ready for that glorious day of his coming. We live in quilpue in the state of Valparaiso where there was a big revival in the biginning of 1900. We await for a bigger one for this nation that much need it. May the lord bless you richly and give you the desires of your heart. Like the lord says on James 4.5… We love you even though do not know you. Pray the ones for the others. 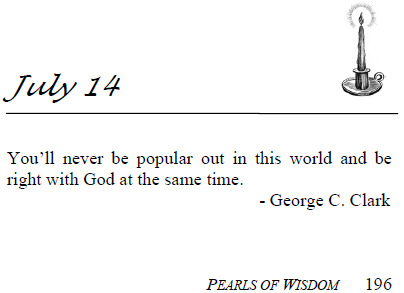 Hey Daddy… How does the July 14 Pearl apply to ppl like Oral Roberts? He was known & loved by a lot of ppl worldwide, although many others may not have liked him. Did Grandaddy mean “popular” as in with pop culture? Or did he mean “right with God” as in specifically knowing the truth about New Birth, etc? Yes, it applies. Brother Roberts was hated and ridiculed by many, many people during his lifetime. He did not really have much favor among most Christians, even though he tried to please them. He was expelled by the leaders of the Methodist sect even though he abandoned the Pentecostal sect to join them. Brother Roberts tried to be a good Christian, to teach Christian doctrine and observe Christian traditions, and he made a valiant effort, but he just had too much of God in him to really fit in with most Christians.